The Beautiful Tibetan Embroidered Isoles! Tibetan Handmade embroidered isoles. They are handmade by the Tibetan women from 100% cotton fabric and colourful cotton thread. 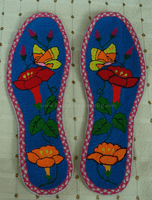 Tibetan people use Isoles with embroidered design which can take care of their feet very well. But I bet you never can put this pair of isoles into your shoes because they are too beautiful. Best collection for embroidered gifts. This pair of Tibetan embroidered isoles was hand picked and inspected by our collect team in Tibet. 100% quality and satisfaction!